Zoo In Argentina Says 'Sad Bear' Too Old To Go To Canada : The Two-Way The plight of the nearly 30-year-old polar bear, who lost his enclosure mate two years ago, has attracted attention from well-wishers the world over who want him moved. Despite a public outcry that resulted in more than a half-million petition signatures and a personal appeal by former House Speaker Newt Gingrich, Arturo, Argentina's "sad bear," has been deemed too old to migrate to Canada. 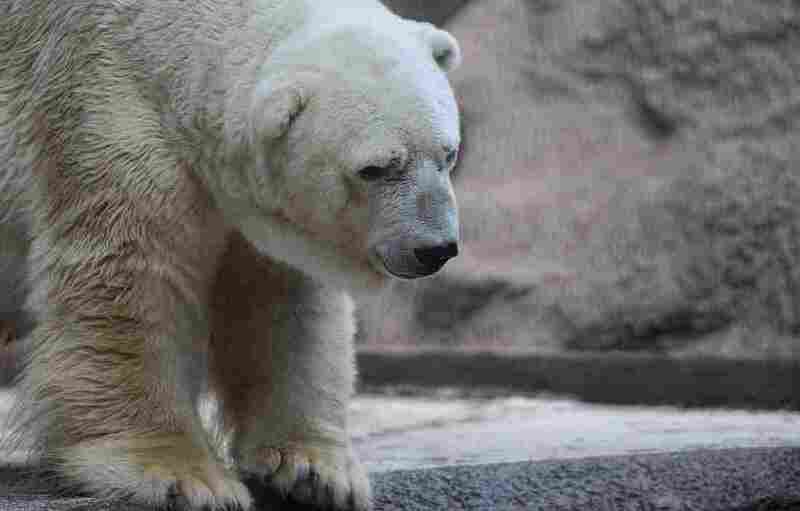 As we reported on Saturday, Arturo the polar bear, dubbed the "world's saddest animal," lost his enclosure mate two years ago and appears to have fallen into a deep depression. Pictures of the animal moping around his habitat at the Mendoza Zoo attracted international concern and launched a petition to have him moved to a facility in Winnipeg. But the Mendoza Zoo says at 28 (some sources say 29), Arturo is just "too old" to be sedated and moved. "The director of Mendoza zoo in western Argentina, Gustavo Pronotto, said that moving him would be a risk. "A panel of vets in Argentina also decided that keeping him in Argentina was the best option."